In addition to its many sports venues, the Hippodrome de Vincennes, a castle, a flower garden, and several cafés are found in the Bois de Vincennes. In the spring there's an amusement park, the Foire du Trône. 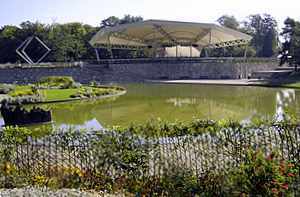 Other notable features of the Bois de Vincennes include a carrousel, a puppet theatre, children's playgrounds, 17.5 kilometers of bicycle trails, roller-skating tracks, 19 kilometers of horse trails, 32 kilometers of closed roadways for walkers and joggers, the Cartoucherie Theatre, and a buddhist temple from the Colonial Exposition of 1931 which has maintained buddhist services since 1977. Bikes can be rented from the Château de Vincennes métro station for EUR4 an hour or EUR15 a day. An exceptional Art Deco building that once held an African art museum now teems with fish instead of artifacts. The Palais de la Porte Dorée Tropical Aquarium fills the basement with tanks of colorful tropical fish, crocodiles, and turtles. The building itself was built for the Colonial Exhibition in 1931. It has an ornately sculpted facade depicting France's overseas empire. A small collection of headdresses, masks, and other artifacts from former French colonies is displayed on the main floor. 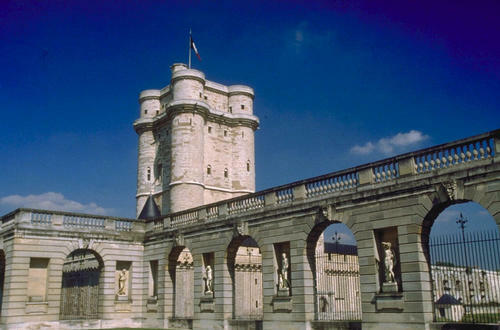 The historic Château de Vincennes is on the northern edge of the Bois de Vincennes. Built in the 15th century by various French kings, the castle is France's medieval Versailles, an imposing, high-walled castle surrounded by a dry moat and dominated by a 170-foot tower. The sprawling castle grounds also contain a modest replica (built 1379-1552) of the Sainte-Chapelle from the Île de la Cité in the center of Paris. The Parc Floral de Paris is the Bois de Vincennes's 70-acre flower garden. It includes a lake and water garden and is renowned for its seasonal displays of blooms. It also contains a miniature train, a game area, and an "exotarium" with tropical fish and reptiles. During the Summer, international music concerts are held in the Amphi-Theatre every Sunday.